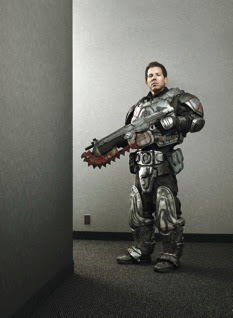 In case anyone missed it, The New Yorker recently published an article on Cliffy B, Epic Games and Gears of War I/II. It's called "The Grammar of Fun," and Tom Bissell is the scribbler. Digression: Bissell is awesome. He wrote an incredible book about sightseeing through Vietnam with his ex-Marine father. He also wrote a pretty good article for NYT last year about hiking Kilimanjaro. In a recent interview, he described his "insane" regimen of writing and gaming - at the time, he was on Far Cry 2, which only makes me love him more.